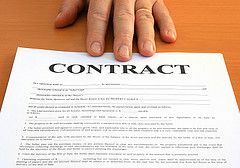 Anecdotally (and from my own experience) there seems to be an increasing trend towards liquidated damages clauses in employment agreements. But are they enforceable in New York? In many long-term contracts, such as in the services industry, it has become rather commonplace for the service provider to insert a liquidated damages clause, which essentially sets forth the specific damages they will be entitled to if the recipient terminates the contract prematurely. I'm sure this comes as no surprise, but at the risk of stating the obvious, not all liquidated damages clauses are enforceable under New York law; on the other hand, not all of them are unenforceable either. Therefore, in order to assess what elements you need to assess whether a particular clause is - or isn't - enforceable, it is important to review the parameters the courts will consider in evaluating the provision. New York's courts have long held (as far back as 1977) that "a liquidated damages provision is enforceable where the fixed amount bears a 'reasonable proportion to the probable loss and the amount of actual loss is incapable or difficult of precise estimation' (JMD Holding Corp., supra, 4 N.Y.3d at 380, 795 N.Y.S.2d at 507 (quoting Truck Rent-A-Center v. Puritan Farms 2nd, Inc., 41 N.Y.2d 420, 425, 393 N.Y.S.2d 365, 369 (1977))." New York's courts have shown an increasing tendency to honor these provisions when they are mutually negotiated between two sophisticated businesses that are on equal, or roughly equal footing; conversely, the courts have refused to honor liquidated damage provisions where they are a penalty that is out of scale with foreseeable losses, or where the provisions are being unilaterally imposed by one side on a far weaker second half to a deal, which is also known as "unconscionability." JMD Holding Corp., supra, 4 N.Y.3d at 378-85, 795 N.Y.S.2d at 506-10; Stenda Realty, LLC v. Kornman, 67 A.D.3d 996, 889 N.Y.S.2d 639 (2d Dep't 2009). One of the most interesting areas where liquidated damages provisions have increasingly cropped up is in the realms of intellectual property and employment agreements, particularly regarding non-compete and non-solicitation clauses. For example, the employer (who typically owns the rights to the IP and/or proprietary client list) will insist on having a provision in the agreement holding the employee (or smaller corporate entity) automatically liable for a stipulated, large sum in the event the latter is ulitmately found liable for breaching the agreement. In these instances, the employer is trying to obviate the tedious (and expensive) process of proving their damages resulting from the other side's breach of the agreement. As a strictly practical matter, the following bears emphasis: a court's determination as to the validity - or invalidity - of a particular liquidated damages clause will often have to await the end of a case. And the reason for this should be fairly evident: the relationship - or the lack thereof - between the liquidated damages clause and foreseeable losses is a fact-specific one, and requires a full and detailed analysis of the facts of the case. Post a Comment to "How Liquidated Damages Clauses Apply in the Noncompete Realm"